Ann Beha Architects, a Boston-based firm with extensive expertise in museum and sustainable building design, was selected to design the new building. SHELBURNE, VT.- Shelburne Museum Chairman James Pizzagalli announced plans for a new center for art and education at Shelburne Museum that will expand the museums educational programs, bring new and exciting exhibits to visitors and, for the first time, open the museum year-round. The announcement opens the public phase of the Campaign for Shelburne Museum, a $14 million capital campaign with the center for art and education as its centerpiece. To date the campaign has raised $10.75 million. The 16,000-square-foot center will include galleries, an auditorium and classroom space and will accommodate a year-round calendar of exhibitions and programs for youth and adult audiences. Currently, the museums 39-building campus opens in mid-May and closes at the end of October. The center for art and education at Shelburne Museum enhances the museums educational and cultural missions. We envision significantly expanded opportunities for the community, for Vermont and for all museum visitors as a result of the new center, Pizzagalli said. *5,000 square feet of gallery space that will be used for temporary exhibitions. New galleries will provide for special exhibitions on a year-round basis, while Webb Gallery will be reprogrammed to exhibit the museums permanent collect of over 500 American paintings. Today, due to space limitations, only a small percentage of the paintings collection is on exhibit. *An auditorium with seating for 130, allowing the museum to offer lectures, presentations and symposia. *2,000 square feet of flexible classroom space designed to be programmed in a variety of ways for different activities and group sizes. *Design that meets the LEED certification standards of the United States Green Building Council including: use of local materials, such as stone, to reduce required transportation of materials and to support the local economy; wood products selected from sustainably harvested forests and energy efficient heating, cooling and lighting. Ann Beha Architects, a Boston-based firm with extensive expertise in museum and sustainable building design, was selected to design the new building. Construction is tentatively planned to start next year with the center opening in 2013. The project, which is still in the planning stages, must move through both local and state permitting processes before construction begins. 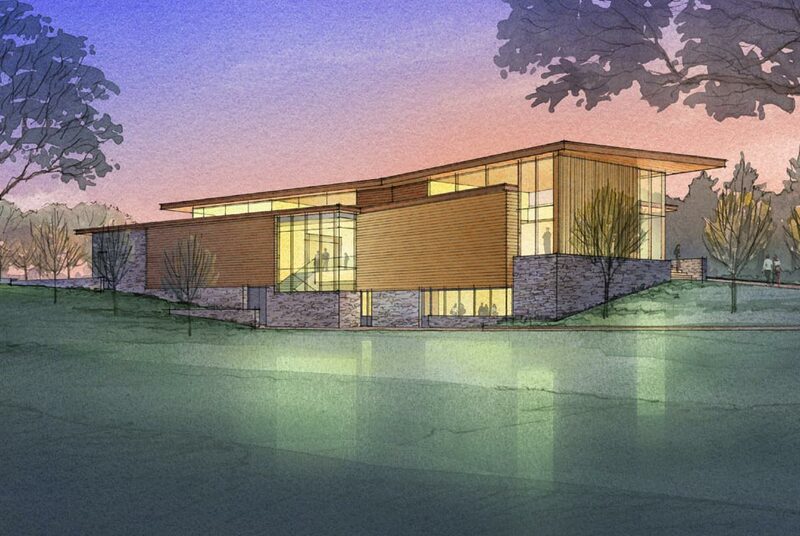 While construction of the new building is the focal point of the Campaign for Shelburne Museum, the campaign also includes an endowment to sustain the ongoing operation for the center and installation of a major fiber optic communications upgrade throughout the museums 45-acre campus. School children will be among the constituencies better served by the projects included in the campaign. Each year about 10,000 children participate in school programs during a short span of several weeks in the spring and fall because the museum is closed for the majority of the academic year. Year-round access, coupled with the centers modern classroom and auditorium and improved Internet access on campus, will enable us to broaden our reach and expand our innovative programming in ways we havent been able to do in the past, said Karen Petersen, director of education at the museum. Visitors come to Shelburne Museum each year from throughout the United States and beyond to view the museums renowned collections of folk art, fine art and Americana. More than half are from Vermont, and they are admitted at half price. In the five and a half months that the museum is open, more than 100,000 people visit, generating an estimated $15 million annually for the local economy. With the new year-round center and the access it affords, the expectation is that visitation will grow and the local economy will benefit.